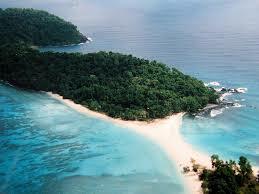 The Andaman Islands are home to the Sentinelese, who have had little contact with any other people. Andaman and Nicobar Islands are developing into a major tourism hub with exotic-looking beaches and pristine islands having equally exotic names, wonderful opportunities for adventure sports like snorkelling and sea-walking. A statue of Vinayak Damodar Savarkar at Cellular Jail. 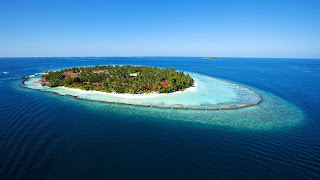 In Port Blair, the main places to visit are the Cellular Jail, Mahatma Gandhi Marine National Park, Andaman Water sports complex, Chatham Saw Mill, Mini Zoo, Corbyn's cove, Chidiya Tapu, Wandoor Beach, Forest Museum, Anthropological Museum, Fisheries Museum, Naval Museum, Ross Island and Viper Island. Other places include Havelock island famous for Radhanagar Beach, Neil Island for Scuba diving/snorkelling, Cinque island, Saddle peak, Mt Harriet and Mud Volcano. 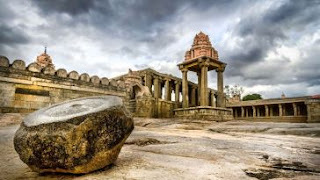 The southern group is mostly inaccessible to tourists. 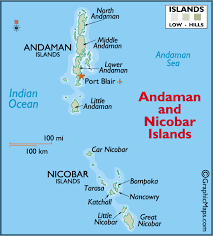 Indian tourists do not require a permit to visit the Andaman islands but if they wish to visit any tribal areas they need a special permit from the Deputy Commissioner, Port Blair. 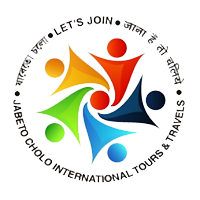 Permits are required for foreign nationals. For foreign nationals arriving by air, these are granted upon arrival at Port Blair. According to official estimates, the flow of tourists doubled to nearly 300,000 in 2012 from 130,000 in 2008–09. 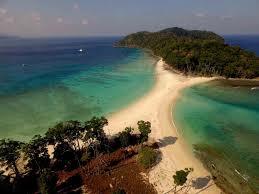 The Radha Nagar beach of Andamans was chosen as Asia’s best Beach in 2004.